Exploring virtual worlds through the eyes and nose is becoming a reality. 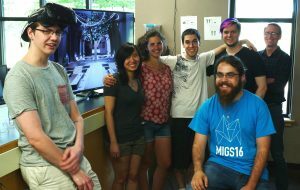 For the past six months, a team of students from the Emergent Media Center have been working on creating a multi-sense virtual reality experience with an emphasis on scents. The experience is called “Eden” and is set in an upscale cocktail bar. There is no human life to be found, only objects that were left behind. The player must figure out what happened by searching around and interacting with the objects. During the experience, users encounter different scents associated with their virtual environment. 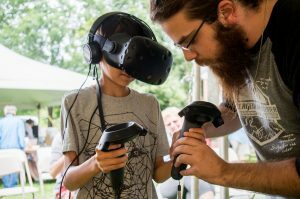 “The focus was just on immersion and making something and all of the interactions with the VR space as realistic as possible,” said Duncan Carroll, Lead Programmer. The team partnered with local business Alice & the Magician. “Eden” was presented in August during Bookstock in Woodstock, VT, and in September at the 25th Annual South End Art Hop in Burlington, VT. This entry was posted in CCM Division, EMC, exhibitions, Game Art & Animation, Game Design, Presentations, Students and tagged Alice & the Magician, Art Hop, Bookstock, Eden, Eden Project, emergent media center, Matt & Eric Design, Virtual reality on October 20, 2017 by cmccalister.